This week's design challenge was to design and evaluate 3-D lo-fi prototypes to demonstrate how OXO might apply their core competency in new ways. The goal of the exercise was to help OXO explore opportunities to expand their business into new areas that start to incorporate sensors and digital UI to for precision results (think Good Grips meets modernist cuisine tools), as well as expanding into new types of product lines. View assignment details here. OXO is known for their emphasis on universal design, which makes their products usable for as many people as possible. They focus on inefficiencies of existing products to help improve people’s everyday lives. In order to apply these principles, my design concepts focused on comfort, ease of use, and simplicity. For each concept, I minimized the number of physical controls and attempted to make the interfaces easy to view from any angle. I created concepts for an immersion blender. I was inspired by the everyday kitchen products that already exist in the kitchen setting – a mug, saltshaker, and spice jar. I found these products easy to use and comfortable to grasp in both left and right hands. In order to test whether or not my assumption that these forms would translate well to a handheld immersion blender, I created three prototypes inspired by the items above. I decided to focus on the experimenting with the form of the handle and physical placement of the buttons and screens. I didn’t worry too much about the look, finish, or texture of the prototypes. I chose to prototype only the handle designs and made an interchangeable base to save time having to create three identical bases. This also allows for experimenting with how different handles might interact with other base attachments, such as a whisk or various blade attachments that could also be powered by the same motor. I also didn’t focus on getting the exact weight, since I found it difficult to test all of these aspects at once. However, I did try to keep the weight within reason by adding clay to weigh down areas where the motor might be located. 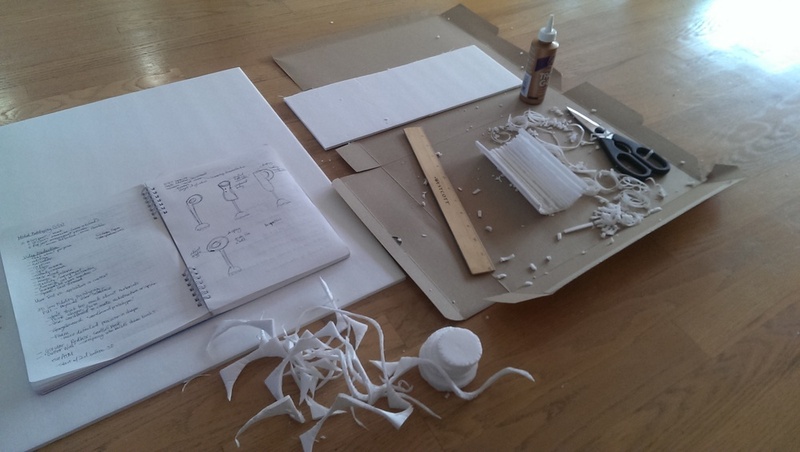 I began with sketching out rough concepts before jumping in to build the prototypes using form core, clay, cardboard, tape, glue, hot glue, etc. Buttons were placed in areas that were easy to controlled while grasped in the hand. For the hourglass prototype, I envisioned that the up and down buttons would be controlled by the pointer and middle fingers, respectively to increase the speed of the blender. For the ball shaped prototyped, I envisioned the controls being operated by the thumb. For the mug handle prototype, I chose a continuous switch type button that could be operated by the thumb while grasping the handle. I tested my prototype in the kitchen of my test participant to get a better idea of how the product would be used in the scenario of blending soup in a pot over the stove, a common use case for handheld immersion blenders. I walked her through the scenario and then asked her to explain her thought process while choosing the handle she would most like to use. By using the think aloud protocol, I was able to discover what worked well and needed improvement on my three concepts. In order to accommodate both left and right-handed usage, I decided to create rotating interfaces for the hourglass and handle shaped prototypes that could be adjusted to any angle to ensure the most comfortable viewing angle for reading speed and viscosity. This would prevent users from having to interpret readings upside down or sideways. For the round ball shaped prototype, I decided to place the interface and controls vertically to ensure visibility for either handed users. I also assumed that the ball handle would be grasped from above. Through the testing, I found out that both the mug handle version and the hourglass version worked well, but that the size of handle and space of the handle had to be the proper size for maximum comfort, otherwise fingers may feel cramped. The hourglass in particular seemed to be the most comfortable in the hand with controls that could be pushed by either the thumb or the pointer and middle fingers. In both cases, the displays were easy to view and read from the top. However, I was disappointed to find out that the tester didn’t notice that she could change the angle of the display. I discovered the most about the ball shaped prototype. Although I intended for the user to grasp the ball from the top using the buttons as a way to orient her hand placement, in reality, she found the ball prototype the least comfortable. She felt more comfortable holding it from the cylinder portion where the display was located. This blocked the ability to read the display easily. She also explained that the angle of the arm required to hold the ball comfortably in the hand was awkward and unnatural. The tester was also more sensitive to the different weights than I had anticipated. When retesting, I would be more clear about explain what aspects of the prototype to pay attention to and also explain some of the limitations of the prototypes being tested. The concept that was most comfortable and easiest to use by the test participant was the hourglass shape that allowed the user to wrap all of her fingers around the handle. This is not what I would have predicted while building the prototypes. However, building three very divergent concepts in parallel allowed the tester to compare the designs, rather than just giving feedback on a single concept. This provided insights that I would not have been able to capture if testing a single concept. Since I was able to test many of the assumptions I made about form, comfort, screen interface visibility, button placement, and hand placement of each concept, I’m happy with the results of my testing. All three prototypes were effective in helping to answer the questions I set out to answer through building and testing these prototypes. Model prototypes are a great way to test design assumptions quickly and cheaply. Creating divergent designs in parallel is very effective for exploring new products. Prototypes can help you evaluated various aspects of a design, so it's always good to know what questions you want answered, so that you can design your prototype to the appropriate level of fidelity. What you want to evaluate with your prototype can also help you choose the most appropriate materials used to create your prototype. The context of the evaluation is important. Simulating a scenario in the context of use helps create a more authentic experience.